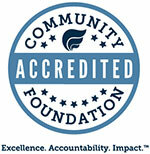 What is the Lehigh Valley Community Foundation? A community foundation is a collection of many charitable funds...many stories...each reflecting the diverse ways people choose to help their community and support the causes that matter to them. For decades, the Lehigh Valley Community Foundation has helped donors with their charitable contributions with a simple, powerful, and highly personalized approach.